This small but mighty local nonprofit is raising awareness of little Bailey, Colorado’s big plans to become the economically thriving trail-sports hub that the Front Range foothills region needs. One of Peak Creative's guiding missions is to provide top-notch, but budget-conscious, services for worthy organizations and individuals. When our friend Shane Kinkennon came to Peak with a nonprofit organization looking for a high-impact web presence to further their cause, Peak was excited to help out. When we learned there was NO budget to build, our philanthropic instincts kicked in. Peak decided to take on the project pro bono and use it as a web dev playground. 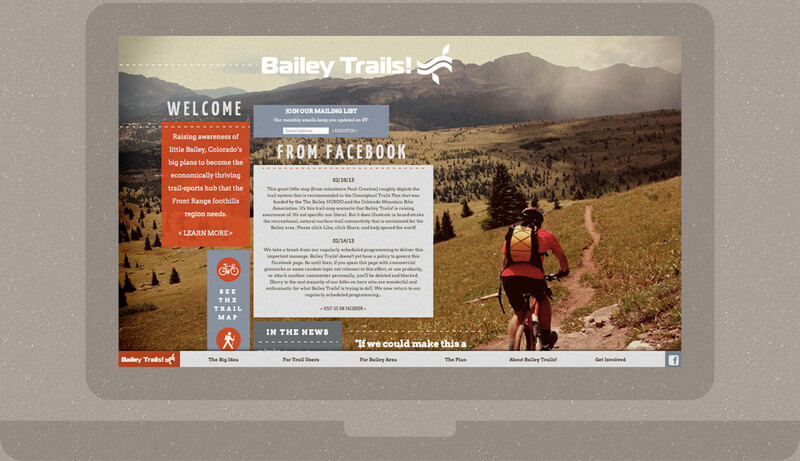 We’re very excited about the results — an informative, vibrant, responsively designed site for Bailey Trails.